Chunk and Curly love the outdoors, but at the moment they are loving doing things that they aren't supposed to, including ripping Nanny's flowers apart, throwing stones and generally destroying whatever is in their line of sight. In an attempt to distract, my sister and I have started to look at more constructive things they can do in the garden, some of which I covered in my recent 42 Days of Summer post. Some of the things we have started to explore are outdoor games, as the boys are now at an age where they can start to understand some of the games such as chase, football and even bowling. The most recent we have tried is the Meadow Ring Toss by Plan Toys. It's aimed at children age 3+ and is the classic ring toss game that has been at fairgrounds for many years. 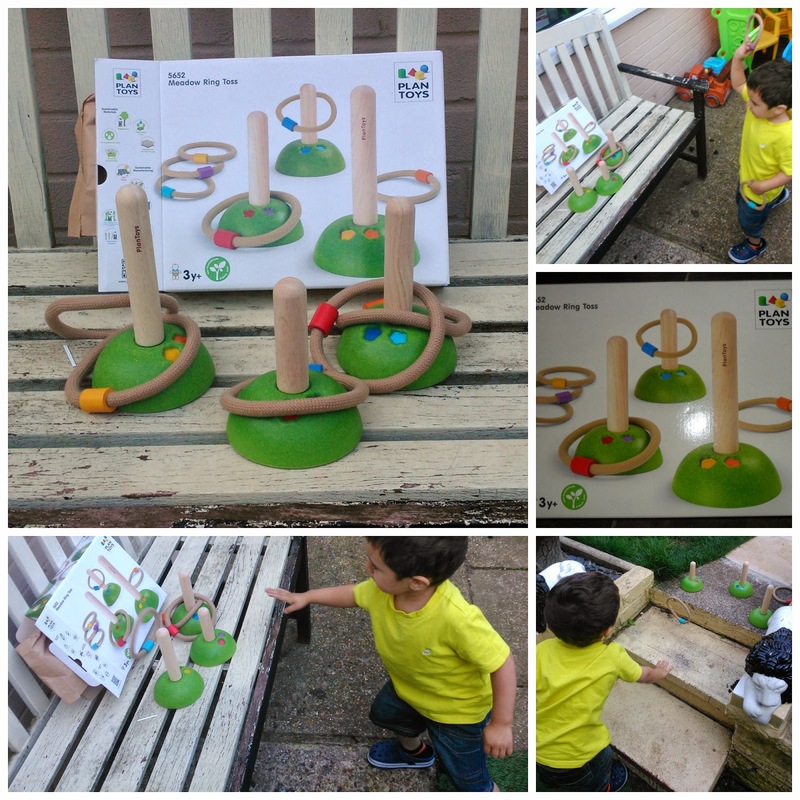 The difference with this set is that there are colours on each of the three posts and the children have to colour match with their rings, as well as attempt to get the ring onto the post (great for hand-eye coordination). The set is made from natural, chemical-free recycled rubber wood, as Plan Toys are all about being environmentally friendly which is pretty impressive. Naturally the game can be played by the rest of the family too, and I spent ages playing with it to show the boys what they needed to do (plus I just love games like that!). Curly particularly enjoyed it, and as you can see from the photos, he liked to be quite close to it, so I did move it to various other parts of the garden in the hopes he would learn to step further back and after a while he did! Thankfully the set is small and light enough to be easily moved, so I will be taking it on my upcoming holiday and also use it indoors during the winter. If you have any other ideas of fun games I can play with the boys, please comment below! Love these sort of traditional ames that gets kids active! What a great game, I'm so glad it stopped them from destroying the garden ;0) I'm glad you all enjoyed it, I think I will had to add it to our wishlist. I bought a set for a 1/3 of the price in the sales and have put away for next Summer! Love a bargain!